My review of Fuji’s biggest and heaviest X Series camera to date has been posted. An X-H1 vs. X-T2 piece in in the works. I don’t follow rumour sites for any products. They fall squarely in the “spoiler” category for me, so I was as surprised as anyone to catch wind of an entirely new body type, with an entirely new initial, “H”. The promo videos featuring music that would lead you to believe the fate of the world hinges upon in-body stabilization have made their all-too-triumphant return. It’s a curious camera. Sized and priced between the X-T2 and GFX 50s,1 it pushes the X Series quite a bit closer to DSLRs I was once familiar with from the “sub LCD monitor” to the enlarged grip. I did not see this one coming from Fuji. It’s a huge shift in strategy, and it’s just great. This is one area the Olympus guys always had us beat. Now we just need to wait until the tech makes its way down the line to the X-T, X-Pro, and maybe even X-E and little X-T. The demonstration is seriously impressive. Very similar to how Fuji demo’d the OIS lenses at Photokina a few years back. It just keeps getting faster. My shooting style very rarely calls for it, but if yours does, and you didn’t jump on the X-T2, this could very well be your camera, provided you’re ok with the size and weight compromises. With a magnesium body that’s 25% thicker than the X-T2 or X-Pro2, this thing is sure to be heavier. That will mean better balancing with Fuji’s heftier lenses, but I think we have left the “compact” camera realm far, far behind with this camera. Considering the size of my X-T2 with the grip and L-plate attached, DSLR owners are going to look at the X-H1 and see very little, if any size and weight disadvantage to their current kit. As a point of comparison, a Nikon D7500 weighs in at 640g for the body only, just 17g more than the X-H1. A Canon 80D is another 10 grams more. Weight in grams, body only. Where the advantage could still lie is in multi-camera ownership. As it stands now, my X-Pro2 is used for my everyday shooting, while the relatively hulking gripped and plated X-T2 is for planned photography outings. So with one set of lenses, I can still get pretty compact, and for dedicated shooting, I likely wouldn’t mind the size increase of moving to an X-H1 from the X-T2. I used to use this feature on my DSLR all the time. I’ve needed it much less with all the dials available on many of Fuji’s cameras, but it would still come in very handy for confirming my aperture on lenses with unmarked rings,2 as well as a bunch of other settings without having to look through the viewfinder after pressing the “Q” button while passersby wonder why I’m photographing the sidewalk. And it even works when the camera is off. We do lose the Exposure Compensation Dial because of this little monitor in favour of a somewhat strangely-placed button, but at least the information aspect is not lost. And we’re back to the threadless shutter release. Hopefully Fuji’s new “Feather-touch” technology will make it so that I don’t feel like I need to email Tim at Match Technical for a soft shutter release. 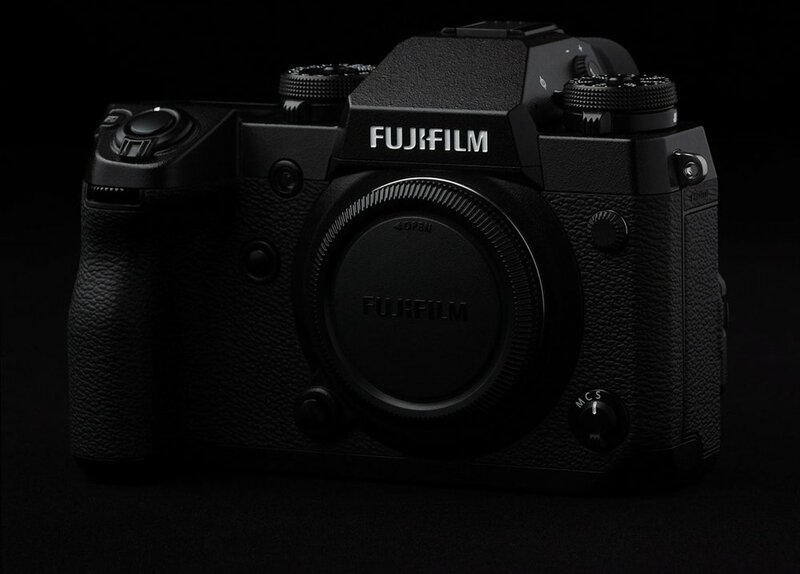 Fuji’s cameras were already pretty quiet, but apparently the X-H1 will be even quieter. This one’s geared at video, but I could see JPEG shooters using it as a base for creative post processing. Of course many people will that’s what RAFs are for, but for the iOS photographer, it could be a good option. I don’t do a lot of video, but I’ve come dangerously close to diving into it. The X-H1 adds a ton, DCI 4K, F-log, separate video settings, but I think there’s one feature Fuji is still missing. Fuji cites this display as being vlogger friendly, and the capacitive touchability will certainly help, but without a flip-out screen, little-known vloggers like this guy probably won’t switch to Fuji anytime soon. It’s a little smaller than the X-T2, but brighter, and I would happily trade 0.02× magnification for 1.33 million dots. Otherwise, the EVF specs out the same as the X-T2 except for one other thing. If I had known the X-H1 was coming, I probably would have held off on my X-T2, which hasn’t been used in the last year nearly as much as I would like. Since I already have an X-T2, and I don’t need the expanded video capabilities, I will probably stick with what I have. If I wanted to go larger, I’d go all the way and buy a GFX if they ever get the price down to more reasonable levels. That could very well change once I have one in my hands.